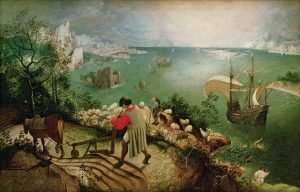 Ovid’s influence on Western art and literature cannot be exaggerated. The Metamorphoses is our best classical source of 250 myths. “The poem is the most comprehensive, creative mythological work that has come down to us from antiquity” (Galinsky). Based on its influence, “European literature and art would be poorer for the loss of the Metamorphoses than for the loss of Homer” (Hadas). Ovid was one of the most popular Latin poets in his time; graffiti quoting him has been found on the walls of Pompeii. Ovid was a major inspiration for Dante, Chaucer, Shakespeare, and Milton (see bibliography on last page). In the first verses of the Metamorphoses, Ovid claims to write one continuous poem, not an anthology of myths. Unlike Homer’s Iliad, however, there is no central hero, thus no simple unity to the work as discussed in Aristotle’s Poetics. So what binds this poem together, making it more than a random collection of stories? All of Ovid’s tales involve metamorphosis. But some stories (see Phaethon, Pentheus, Heracles) only have metamorphosis tacked on as an incidental element, almost as an afterthought. The work shows general chronological progression, beginning with the story of creation and the flood and ending in Ovid’s own era with Augustus on the throne. However, chronology becomes unimportant in the vast middle section of the work, as seen in the numerous anachronisms throughout (see notes on Callisto, Atlas, Cycnus stories for examples). Daphne and Apollo: with focus on the chase, her metamorphosis into a tree serves as Daphne’s means of escape. Jupiter and Io: with emphasis on Juno, the jealous wife, the metamorphosis serves as Io’s disguise in hiding from Juno (both these early instances make the gods appear comic). Syrinx and Pan: a meta-narrative or story within a story, told by Mercury, serving to put Argus to sleep. Jupiter and Callisto: similar to the Juno/Io plot but not treated comically. Jupiter and Europa: serves primarily as a transition to the story in Book 3 of Cadmus’ exile. This narrative technique of theme and variations gives Ovid numerous means to tell his stories in inventive ways, weaving a complex web of interrelationships throughout the entire work. This thesis, suggested by Brooks Otis (Ovid as an Epic Poet, 1970), will organize (with some modification) the discussion notes on the following pages. Following this outline, we see a general movement from gods acting like humans (section I), to humans suffering at the hands of gods (II), to humans suffering at the hands of humans (III), to humans becoming gods (IV). Each section prepares the reader for future sections. The tales of the Minyads (section II, book 4) foreshadow the thwarted or forbidden loves in section III. Hercules’ becoming a god (section III, book 9) points toward those later of Aeneas, Romulus, Caesar (section IV). Thus, throughout the work Ovid creates a complex web of interconnecting themes. Throughout the notes are links to other ancient works of mythology, most of which were available to Ovid. Homer’s famous epics, the Iliad and the Odyssey were written sometime in the 8th century BC. Homer’s contemporary Hesiod wrote his Theogony about the birth of the gods around the same time. The Greek playwrights Aeschylus, Sophocles, and Euripides composed their tragedies during the 5th century BC. Virgil completed his Latin epic the Aeneid, patterned after Homer, about 19 BC, a generation before Ovid. The Library of Apollodorus was attributed to a writer in the 2nd century BC, but scholars believe the work was actually written more than a century later by an anonymous author; it may or may not have existed prior to the Metamorphoses. Hyginus wrote his Fabulae sometime in the 1st or 2nd centuries AD, after Ovid. Originally published online February 2000. Latest revision September 2018.